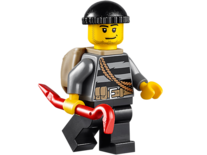 Crooks are a City minifigures that are commonly seen in the Police subtheme. The Crook minifigure has a face with stubble and a devious-looking smile. He has a gold tooth in most sets, although in 7744 Police Headquarters, there is one with no stubble and a closed mouth with scowl. The shirt has a 1960's-style stripe decoration, the number 50380, and a loose collar revealing chest hair. The prisoners always wear a beret-style skullcap. 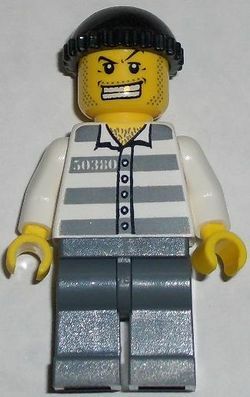 This style of prisoner minifigure was the successor to the jumpsuit-wearing prisoner seen in World City. In 2012, two new variations will be released, as city is relocating to a forest-themed area. One with a sleeveless shirt and muttonchops, and one with Sand Blue overalls and a burgundy cap. In 2013, two new variations will be released, one with a mustache and mask, as well as one with stubble and snarl. The Crook is the perpetual bad guy of the City, and is constantly getting captured by the Police. LEGO Club Magazine Issue 1 2011 - contents page, The Big Crime Wave! This page was last edited on 2 March 2016, at 18:11.